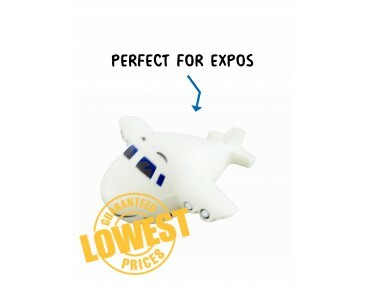 Get your brand flying to new heights with this quirky stress toy. It is cute and adorable and will charm your clients when you hand them out as freebies at corporate events, conferences and seminars. Brand them with your company logo and graphics and create a hum around your image. Your clients will be thrilled to receive these fun little gimmicks. Stress toys are perfect for all ages and all types of people. Bash them, smash them, squeeze them and get rid of all your frustrations. Our fun little aeroplane offers a comic style design in three-dimensions. It is made from a durable and pliable material that returns to its original shape after being squashed. It comes in a light colour and features a fun round nose with dark windows and a corporate colour trim. Two wings with engines extend on either side and wings at the back tail create an authentic finish. Companies in the aeroplane industry, travel and holiday business will make fun impact with these toys. Allow us to help you with branding ideas. Our listed price includes branding of your logo or graphic in a single colour print. Please note that our prices exclude GST and a print set up of $75 applies. We can supply this product unbranded if required.